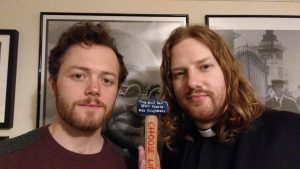 Early on the morning of January 29, Reverend Dan Woodhouse, a Methodist minister in Leeds, and Quaker activist Sam Walton entered BAE Systems’ Warton site in order to disarm warplanes bound for Saudi Arabia. Both have been arrested and are being held “on suspicion of criminal damage” in Blackpool. Their actions are aimed at preventing BAE’s delivery of fighter jets to the Saudi government. The planes were due to be shipped from the base in the next few weeks. A Saudi-led coalition has been carrying out devastating airstrikes in Yemen since 2015, and international human rights organisations have condemned the bombings, with widespread allegations of war crimes. 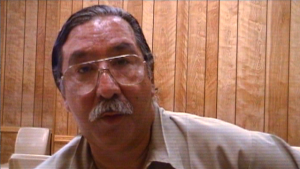 January 18, 2017, in a letter addressed to Leonard Peltier’s lawyer, the Obama administration formally denied the request to grant clemency to Peltier. Leonard Peltier, a Native rights activist and member of the American Indian Movement, has been incarcerated since 1976 convicted of a crime he did not commit. Peltier’s struggle to gain freedom has crossed the globe and supporters include the likes of Mother Theresa and Desmond Tutu, whom have all called for his clemency. Occupy Beale started off a new presidential administration with a protest on Tuesday morning, January 25 at the Main Gate of California’s Beale Air Force Base, home of the Global Hawk drones. 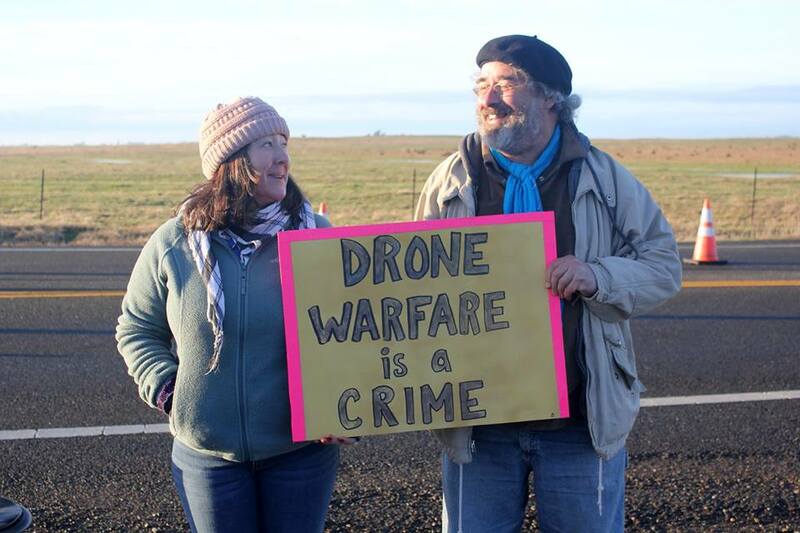 Before dawn, yellow “Crime Scene – Do not Cross” tape marked the Beale Air Force Base sign, which was also labeled with a poster stating that “Drone Warfare is a Crime.” Air Force police ignored this warning and once again arrested the wrong people, taking Flora Rogers and Brian Terrell into custody. 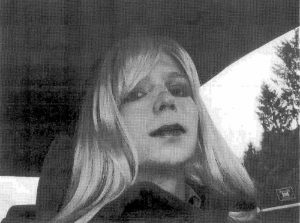 After a brief and cordial detention, they were released with federal trespass citations. “They say ‘if you see something, say something’ but they don’t like it when you do,” remarked Brian Terrell. 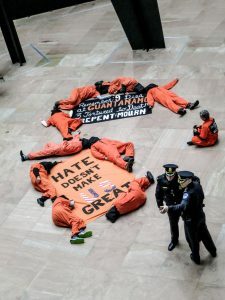 Clad in orange jumpsuits and Shut Down Guantanamo t-shirts, activists with Witness Against Torture (WAT) took over the Hart Senate Building on January 11 with a message for Senators, staffers, and the general public. They marked the 15th anniversary of the opening of the prison at Guantanamo Bay, Cuba. The message was “Shut Down Guantanamo,” “No Torture Cabinet” and “Hate Doesn’t Make U.S. Great.” These statements were painted on banners that activists dropped from a balcony and spread on the floor as 9 members of the group dressed in orange jumpsuits and black hoods held a die-in, mourning those Muslim men who died at Guantanamo without ever being charged with a crime. The nine, plus three others, were arrested by Capitol Police as supporters sang “Oh America, don’t believe their lies. Their politics of hate will destroy our children’s lives.” The balconies were crowded with onlookers as the action unfolded. 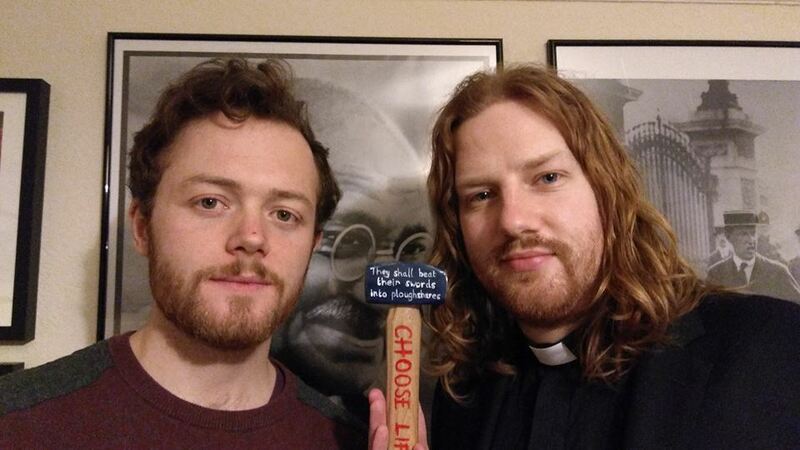 One of the two who unfurled the “No Torture Cabinet” banner was also taken into custody.